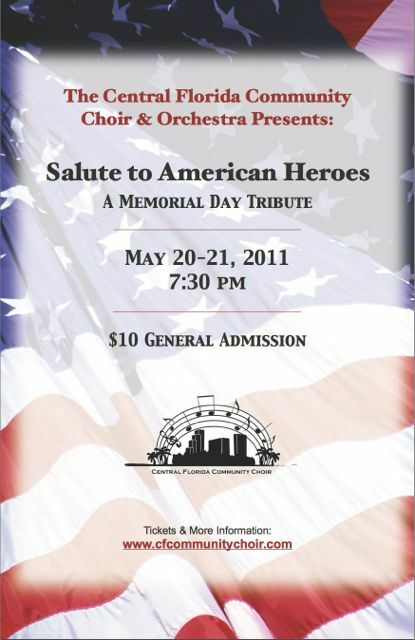 On May 20 & 21 of 2011, the Central Florida Community Choir and Orchestra performed their inaugural concert which honored those who have served in the United States Armed Forces, Police, Fire and Rescue. The 125 voice choir and 30 piece orchestra performed for an audience of over 1200 people between the two nights. At 7:00pm on the evening of Presidents’ Day, February 20, 2012, CFCA is proud to offer a concert version of that presentation, produced in conjunction with ArtsFest 2012. This concert will be free of charge, with requested donation. The video and pictures below were taken during our 2011 concert and offer a small taste of what can be expected on that night.